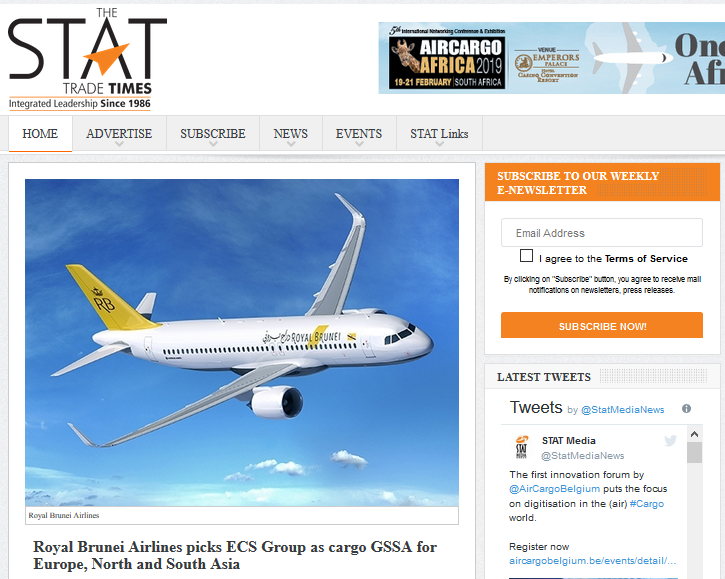 Leading General Sales & Service Agent (GSSA) ECS Group has inked 3 years contract with Royal Brunei Airlines in order to support the air carrier in its strategy for cargo growth in North and South Asia as well as in the whole of Europe. Royal Brunei Airlines serves the destinations Dubai, Jeddah, Bangkok, Singapore, Ho Chi Minh City, Seoul, Kuala Lumpur, Kota Kinabalu, Hong Kong, Shanghai, Manila, Denpasar, Surabaya, and Jakarta from its hub at Brunei International Airport (BWN). The carrier will start services to London (LHR) with daily non-stop flights between Brunei and London effective October 28, 2018. ECS will help to expand Royal Brunei’s network in providing additional road services from London (LHR) to all parts of Europe. On its North and South Asia routes, Royal Brunei operates a fleet of A320 aircraft with a cargo capacity of 2 tonnes. Routes to Melbourne, London (LHR), Jeddah, and Dubai are being served by Boeing 787 air freighters designed to carry up to 15 tonnes of commodities. This collaboration will help Royal Brunei to control 19 stations in different parts of the world and benefit from a network filling space where required and thus providing the highest yield to the airline.